In last November’s Undergraduate Council presidential election, the UC saw its lowest voter turnout since it began popularly electing its leadership in 1996. Near the end of a meeting last month, then-Quincy House Representative Wyatt M. Robertson ’18 rose to address the Undergraduate Council, Harvard’s student governing body. In an at-times emotional speech, he announced he planned to step down from the UC. But he had some parting advice: look to Gus A. Mayopoulos ’15. Mayopoulos served as UC President in 2014; he won a surprise victory after running on a joke ticket that promised more tomato basil ravioli soup and thicker toilet paper. Nonetheless, though, Robertson said he thinks student engagement with and interest in the UC under Mayopoulos’s tenure was far greater than it is today. He particularly pointed to a student rally organized by Mayopoulos and then-Council Vice President Sietse K. Goffard ’15 in Feb. 2014 to demand a $250,000 increase in UC funding from the University. The rally drew roughly 100 students to the Yard—and ultimately helped secure more money for the Council. “The student body was so involved with the UC because [the Council] shed all their formalities and they really got on a level with all the students,” Robertson said. Now, though, Robertson and other representatives say they think the student body is growing increasingly disengaged with the Council. He and other Council members reference low voter turnout in recent years, arguing it reflects a broader lack of student engagement and stems in part from a failure on the part of the UC to communicate with the student body in a streamlined way. The most recent Undergraduate Council presidential election—held Nov. 2017—saw the lowest-ever voter turnout since the Council first began electing its leadership via popular vote in 1996. Just 2,074 undergraduates voted in the election, a 32 percent decrease from the previous year. Some on the Council also say they fear UC members themselves are becoming less engaged with the body and its work. These worries are not new: the Council has grappled with a lack of engagement for years. At a meeting in late 2014, for example, UC representatives discussed whether structural problems within the body could be helping foster general apathy towards its work. 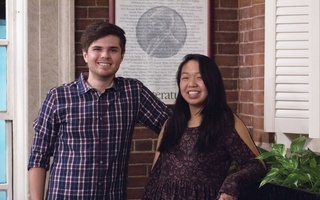 Amidst these concerns, UC President Catherine L. Zhang ’19 and Vice President Nicholas D. Boucher ’19 say they are taking steps to improve the Council’s communication with undergraduates. Mayapoulos’s Feb. 2014 rally failed to win explicit approval from administrators for the funding increase. But money nonetheless began to trickle in—funding that eventually helped free up some of the UC’s budget for other priorities. Later that same year, the College provided $21,000 to support a UC initiative that promoted collaborative events between student groups and considered footing the bill for the funding of two student groups—Drug & Alcohol Peer Advisors and the Phillips Brooks House Association—to which the UC had previously provided over $35,000 annually. These tangible results may have drawn in part from visible student buy-in at the rally. Robertson says he thinks the level of student excitement seen during Mayopoulos’s term has largely disappeared—a change he lamented at the February UC meeting. Mayopoulos declined a request for an interview Monday, saying he did not want to “interfere” with the Council’s current operations. In recent years, many undergraduates have shown interest in specific UC initiatives, like the push for a multicultural center and a new UC-run program that facilitates faculty-to-student interactions over catered dinners. A January town hall about the proposed multicultural center, led by two Council members, drew over 70 attendees. Nonetheless, some representatives point to last fall’s electoral turnout figures—as well as the larger downward trend in engagement—as proof the Council is now facing serious issues of student disengagement. Asked about possible reasons for the low voter turnout, at least two Council members said the apparent lack of enthusiasm from students could result from a deeper disconnect between representatives and their constituents. Lowell House Representative Michael E. Scherr '20 said he thinks the UC's lack of focus on the day-to-day lives of undergraduates is eroding its influence among undergraduates. “On the big issues here at Harvard, the Undergraduate Council consistently misses the ball,” he added. In interviews this week, both Zhang and Boucher conceded the Council’s communication with the student body has been poor in the past. The duo said they are seeking to improve the situation; in one example, they are working to debut a new Council website meant to better facilitate the dissemination of information and College resources. Zhang also argued the lower turnout can at least partly be attributed to issues with the voting system. 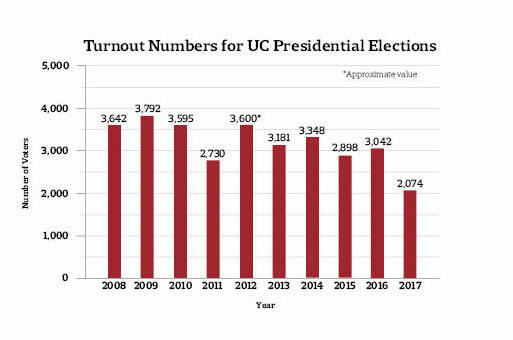 Even putting aside last year’s especially low figure, though, turnout for UC presidential elections has been trending downward for years. In six of the seven elections between 2004 and 2010, over 3,500 students cast ballots. Only once since then—in 2012—has turnout again surpassed that figure. The Council has been forced to respond to this continually low turnout. Prior to last year, UC-sponsored referenda could only be considered binding if a majority of undergraduates voted in November elections. But the Council scrapped that requirement last year following two consecutive years in which a majority of the student body did not cast ballots. In addition to external student disengagement, the UC may also be facing lowered internal enthusiasm. A perceived lack of engagement on the part of some Council members has caused tension on the UC during general—meaning body-wide—meetings this year. Zhang announced in January that general meetings—which begin at 7 p.m. most Sundays—would conclude at 9 p.m., barring successful motions to extend them. On multiple occasions this semester, the Council has voted down motions that sought to extend meetings to permit members to finish voting on scheduled legislation. Tensions boiled over at last Sunday’s meeting—the body’s last before the College’s scheduled spring break—after the Council voted down two such motions. As a result, two pieces of legislation were tabled, including one that would have subsidized bicycles for low-income students in the Quad. The second vote to extend the meeting ended in a tie. 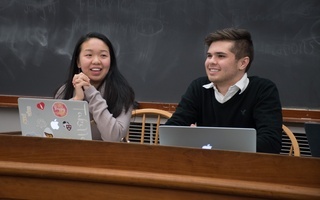 Amid some confusion about whether the Council would consider a further motion brought by Winthrop House Representative Evan M. Bonsall ’19, Zhang broke the tie and ended the meeting. The exchange prompted Bonsall to sharply criticize the UC’s leadership, arguing that not extending the meeting represented a failure of the Council to serve the student body. In an email sent to Council members after the meeting, Pforzheimer House Representative Rainbow Yeung ’19, an inactive Crimson blog editor, repeated Bonsall’s concerns. “I am incredibly disappointed by the lack of commitment and the general laziness of the Council, not only from members at large, but also (especially) from our leadership,” wrote Yeung, who co-sponsored the bicycle legislation. Zhang said in an interview Tuesday that she decided to end the meeting in order to make sure representatives wouldn’t miss their scheduled office hours and to “honor” the vote earlier in the evening in which the Council had struck down a similar motion. “When it ended up being a tie, I said, ‘Let me honor what was originally voted by members in this Council,’” Zhang said. In addition, attendance at certain general and committee meetings has been somewhat spotty so far this semester. At multiple committee meetings this semester—including two Rules Committee meetings—legislation could not be considered because quorums were not met, according to Rules Committee Chair Wilfried J. K. Zibell ’21. Attendance at general meetings is in line with those of the past two semesters, according to records provided by former UC Secretary Ruiqi He ’19. Four representatives have missed three or more meetings within the first six of this term so far, compared to three last fall and two last spring. 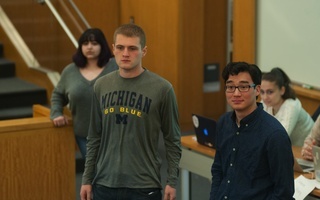 Zhang and Boucher say they are working to improve the Council’s communication with undergraduates and to more stringently enforce attendance requirements for UC members. The pair particularly referenced their planned overhaul of the Council’s website—one of the duo’s key campaign promises, which they said they will debut in the coming weeks. The redesign will provide students with a platform to better connect with not only the Council but also the vast resources of the College, according to Zhang and Boucher. Last year, the UC’s leadership renewed efforts to enforce the Council’s requirement, outlined in its bylaws, that representatives hold weekly office hours. This semester, at least one representative from each house and freshman yard will sit in a central location—usually a dining hall—after general meetings to meet with constituents. At a recent meeting, the Council passed funding slated to allow for food and raffles at office hours. Though some representatives say they have had trouble attracting students to their office hours, even a small amount of engagement with constituents is important, Boucher argued. Zhang also highlighted the Council’s new centralized email system, which she said will “streamline” the Council’s communication with students. The new system will feature a weekly email from the UC to all undergraduates containing updates about key UC initiatives. Still, the duo said there are areas for improvement. Boucher says he thinks the Council could do a better job of “branding.” Students often are unaware that events they attend are funded in part by the UC’s Finance Committee, he said. At its Wednesday meeting, the Finance Committee considered a change to the policy guide requiring flyers for UC-funded events to include the Council’s logo, but failed to implement any changes. “We all agree that some change will be made, but we don’t know exactly what it would be,” committee chair Henry Atkins ’20 said after the meeting. In addition, Boucher said that, though past UC executive committees had only “loosely enforced” the official UC attendance policy, he plans to change that going forward. The policy mandates that committee members who miss more than three meetings in one semester be placed “under review.” If the UC representative under review is not “exonerated,” the Council’s leadership must expel that individual from the Council and enforce that expulsion until fall elections of the following school year, according to the UC’s constitution and bylaws. Despite what some call the Council’s communication troubles and the declining voting figures, Boucher insisted that the ability of the UC to improve the lives of students should not be underestimated. He recounted a Finance Committee meeting last year that he called the “most meaningful” he has experienced in his time on the UC. ​The Undergraduate Council will fund $1,000 worth of non-alcoholic “house-centered parties” this semester, due to a new Student Initiatives Committee policy. We believe the Zhang-Boucher ticket brings the experience, accountability, and transparency necessary to best serve and represent the undergraduate community.